My puppy Cedric has a short fur coat and can’t tolerate cold weather without some type of jacket. It’s sad to see him shivering on a walk when the temperature is 40 F or below. 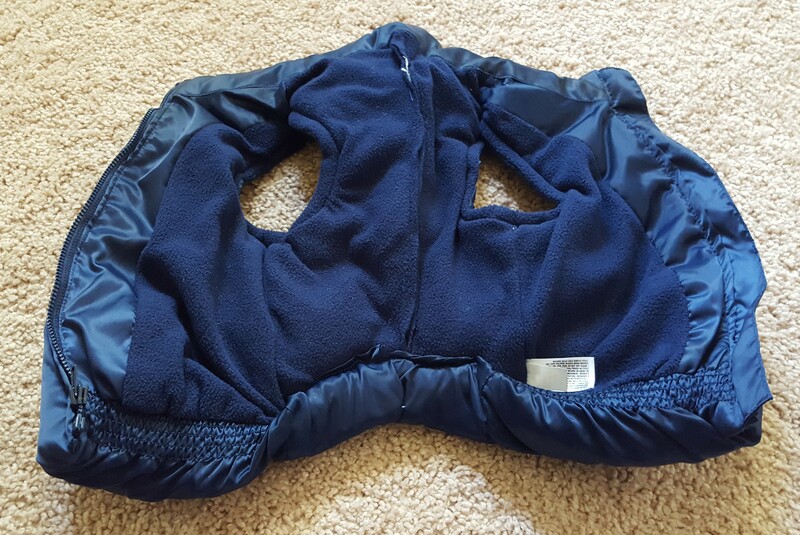 Making or re-purposing cold weather clothes for my dog has saved me a significant amount of money, not taken a great deal of time, and has helped me practice my sewing skills. My first attempt at making dog clothes was an Urban Threads tutorial for a hound dog hoodie. I started with a large blue crew neck sweatshirt from Goodwill that cost $2. The finishing of the raw edges left some quality to be desired, but Cedric looked cute! Ready for fall in my new sweatshirt. 😎 My human is new at sewing clothes, but I think she did a great job. ❤ Thanks @urbanthreadsemb for the free hound dog hoodie pattern! Then, Cedric gained about 7 lbs over a few weeks, and the hoodie became much too small. I tried making alterations without making a whole new hoodie, but my modifications left him with an odd hooded cape with a belly strap that would shift around and didn’t provide enough coverage for cold autumn mornings. Next, I tried getting human clothes for my puppy. Dog bodies are a bit different from human bodies. Their front legs are not proportionally in the same place as human arms. Because of this, a dog can sometimes wear a human vest with no sleeves if the vest “front” is worn on his back. Goodwill became my go-to store. This sleeveless flannel zip-up vest by Carter’s is sized for a 9-month-old infant but it fits my 15 lb puppy pretty well. It cost me a cool $1.00 before sales tax. I’ve seen similar light fleece dog apparel for at least $15.00. Winter is coming, so I wanted to get Cedric something warmer and snow-resistant. 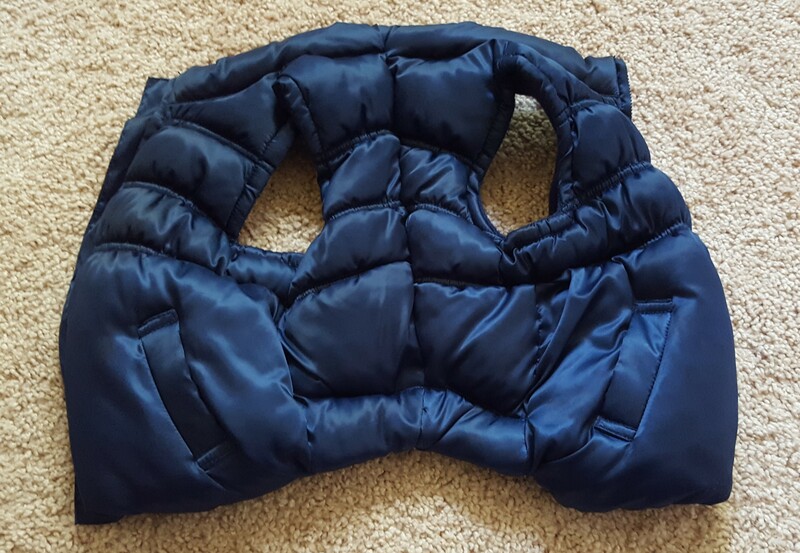 One of my Instagram friends suggested getting a child sized winter puffer vest. I found this 2T sized Old Navy vest at Goodwill for another $1. A similar dog coat can cost anywhere from $25 to $50+. As you can see, it needed alterations. Ethan and I had a good laugh, but Cedric looked like a waddling puffball. It took a little bit of forethought and many fitting sessions to get it right. 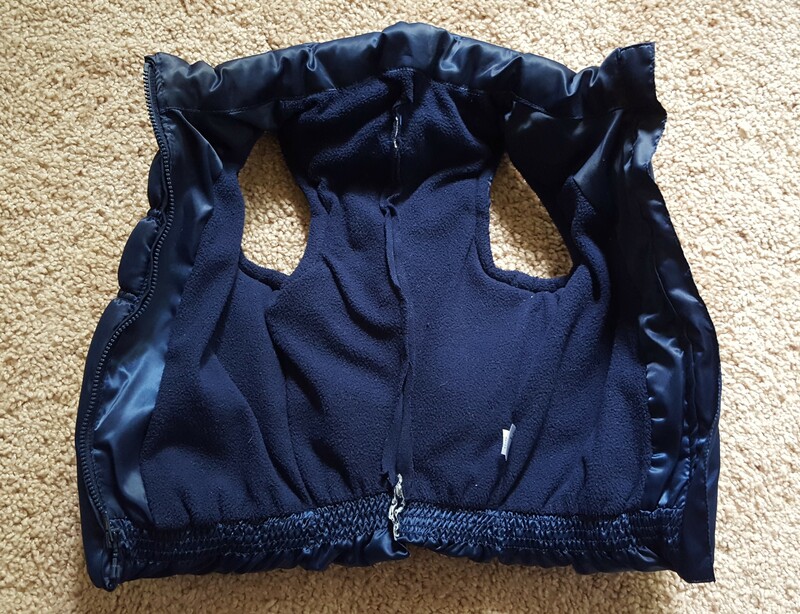 I ended up slicing through the center of the vest between the arm holes, through the interior fleece, the polyester fill, and the exterior. To make a hidden seam on the outside and help retain warmth, I pulled the exterior into the interior and figured out how much to take it in. I ended up removing a fair amount of the polyester fill, and I pushed away the fill around the areas I would be sewing. I made a new seam through the outer fabric and the inner polyester casing, sewing with my machine using a walking foot, which is good for sewing through thick layers. Then I cut away the excess material, pulled the interior fleece taught and made a quick inner seam. I was not concerned about the raw edges being visible on the inside. The only other major modification I made was to roll up part of the bottom edge (on the dog’s underbelly) into the coat’s interior to allow Cedric to go to the bathroom. I removed some of the filling again to reduce bulk and sewed though all the layers at once. Here’s to a warm puppy in cold weather! I will definitely be using this diy!